The St. Louis Arc provides autism and behavior services to more than 1,000 children and adults, including cutting edge therapies like the Early Start Denver Model. Since its inception in 2010, the Autism Invitational has raised more than $1.4 million for autism services in the St. Louis area. The scenic Boone Valley Golf Club (ranked #1 in the State by Golf Digest) provides a magnificent backdrop for this amazing day – as well as the perfect setting to witness the solar eclipse! 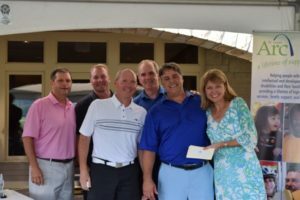 The St. Louis Arc thanks its generous co-chairs Tom Caruso and Dan Kelley, and tournament chairwoman JoAnn Kindle, for making this amazing day possible. For information about the 2019 Invitational, contact Tessa Klassen, Special Events Manager, at 314-817-2241. To read more about the 2018 Autism Invitational, click here.